Kenmore is a popular line of sewing machines, widely sold at Sears retail stores and online. The Kenmore Mini Ultra sewing machine is a lower priced model, favored by beginners. 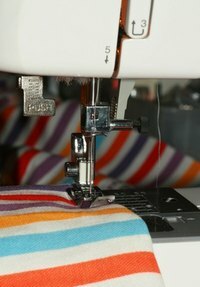 For the proper use of your Kenmore Mini Ultra, you must be able to thread your sewing machine correctly. This is a very easy process to learn. The Kenmore machines featuring 11206 in the model number include the Mini Ultra line of Kenmore sewing machines. Place the sewing machine thread on the spool pin. This is located on the right side of your Kenmore Mini Ultra sewing machine, towards the back of the machine. Pull your thread off the left-hand side of the spool. Clip the thread into the metal thread guide located towards the far left of the sewing machine. Hold the thread tightly as you begin the threading process. Pull the thread downward into the right section of the thread channel, ensuring that the thread locks into the tension disc to the left of this channel. Move the thread upward at the bottom of the thread channel, ensuring that it catches in the spring. Continue upward on the left portion of the thread channel. Place the thread into the take-up lever, from right to left, when you reach the top left portion of the thread channel. Draw the thread downward towards the needle. Place the thread into the needle bar thread guide. This sits to the left of the shaft that holds your needle. Clip the end of thread with a pair of sharp sewing scissors, and wet the end of the thread if desired. Guide the thread tip into the eye of the sewing machine needle from front to back. Pull the thread to the back of the needle, allowing 1 to 2 inches of slack. The Kenmore Mini Ultra sewing machine features a color-coded, visual thread diagram that illustrates these instructions. To simplify the threading process, you can tie a new color of thread to the previous spool, and pull it quickly through the threading channel, with tension loosened. If your tension is not working properly, check to ensure that you have caught the thread on each necessary portion of the thread channel, including the tension disc.